Chicago. The Windy City. As one of the most important and iconic cities in the United States, Chicago was a city we were really looking forward to visit. As a sport town, Chicago also ranks as a premium destination, and as luck would have it, our visit came on the heels of the Cubs’ historic World Series win. The Blackhawks aren’t slouches either, with 3 Stanley Cups in the last 6 years, and currently at the top of the Western Conference, a spot they’ve grown accustomed to. The Canadiens have struggled for years in Chicago, so despite a 3 point lead at the top of the NHL standings, we knew it wouldn’t be an easy game, especially after having played the night before. But we knew we’d get a great hockey game on this trip. Coming into O’Hare in the morning. My wife and I flew into O’Hare on an early morning flight. It’s never easy to get up at 3:30 AM to catch a flight, but it’s so worth it to have as much time as possible to see the city. A little weary, we grabbed our rental car (a mistake: we should have taken the train or Uber into the city) and headed downtown. Driving in a major city can be intimidating, but on a Sunday morning, traffic was light and I was able to easily follow the GPS. 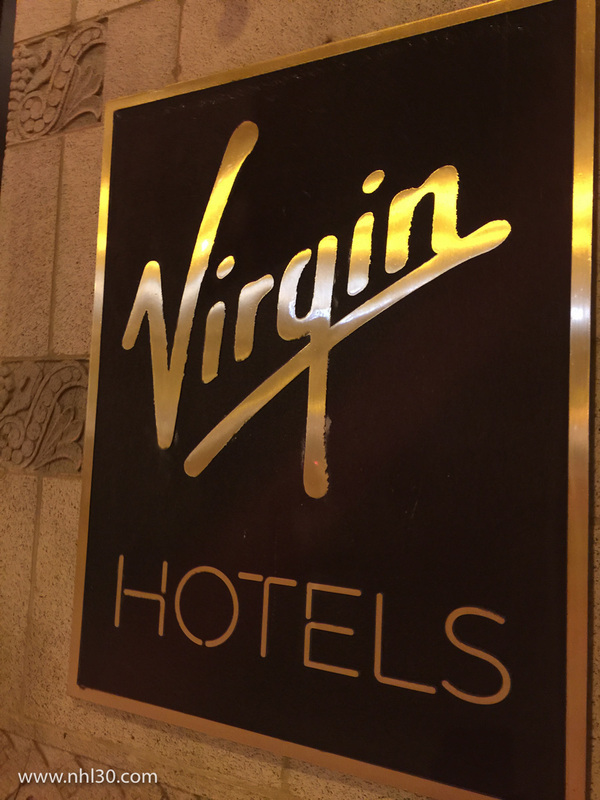 We had booked a room at the Virgin Hotel, located south of the river about halfway between Millennium Park and the Magnificent Mile. It’s the first in what Virgin hopes to be a worldwide chain, and it has that quirky Virgin attitude that’s simultaneously endearing and disrespectful. Checkins are done on tablets, and we got help from James, a towering black guy with an afro with a dyed stripe on top. Despite his unusual appearance, James would prove very helpful throughout our stay. The hotel mixes Swinging 60’s London (think Austin Powers) and modern technology in an IKEA-style design to make the most of the small footprint of each chamber (as they are called). The hotel is new and is still very clean and comfortable. The L train runs right on its corner so it can get noisy (the hotel provides you with earplugs, which is a giveaway), but our room was on the 24th floor of the 35 story building, and it was quiet. As a bonus, the height gave us a nice view of the city. A quick look at Google Maps to familiarize ourselves with the area, and we went off exploring. Getting out of the hotel, I noticed a gorgeous bright red Tesla parked out front. But more on that later. Heading out north, you can’t miss the majestic Trump building looming above all other buildings around it. We headed for the Magnificent Mile, a stretch of road lined with high profile shops and fantastic architecture. 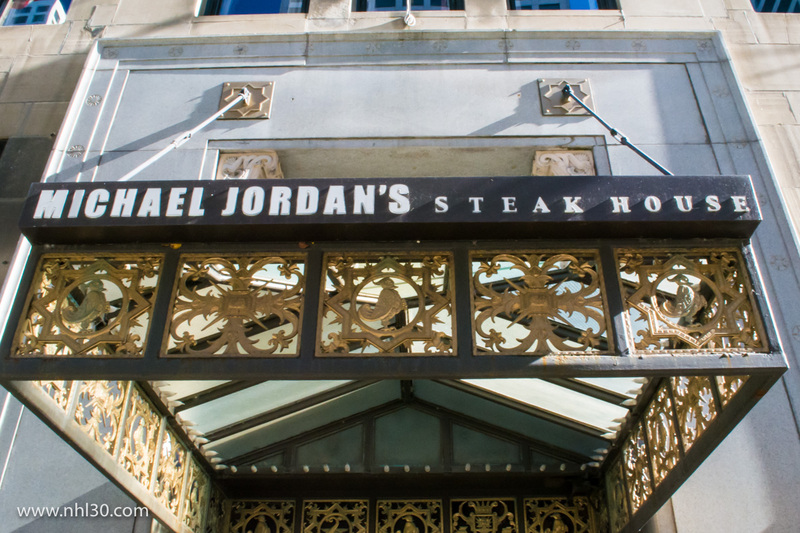 But the one hour time difference was making itself felt, and our stomachs led us to Michael Jordan’s Steakhouse for lunch. I expected a regular sports bar, much like Wayne Gretzky’s in Toronto, but MJ’s Steakhouse is an upscale establishment serving great food and great drinks. The burger was amazing! We skipped dessert and headed to the nearby Dylan’s Candy Bar for some sweet purchases, followed by a stop at Ghirardelli’s, the great San Francisco chocolate maker. We weren’t really hungry but couldn’t resist the delicious ice cream. We definitely needed a walk after eating that! We admired the architecture for a while in the area known as the Loop, stopping for pictures any time a building struck our fancy. Our walk took us to Millenium Park, where modern art pieces are on display across its length. One of the most famous pieces is the Cloud Gate, a large polished, reflective bean shaped structure. I loved how the buildings reflected on its surface, along with the many tourists attempting to catch a selfie on it (I must admit I joined in). But by that time, light was slowing fading, and we decided to head out to the United Center for some pictures before it got dark. It was a 6PM game, an unusual event for us, but with the time difference it felt like our regular 7PM weekend start. We hailed a Uber and were on our way. The United Center opened in 1994, with a capacity of 19,700, going up to 22,428 including standing room. 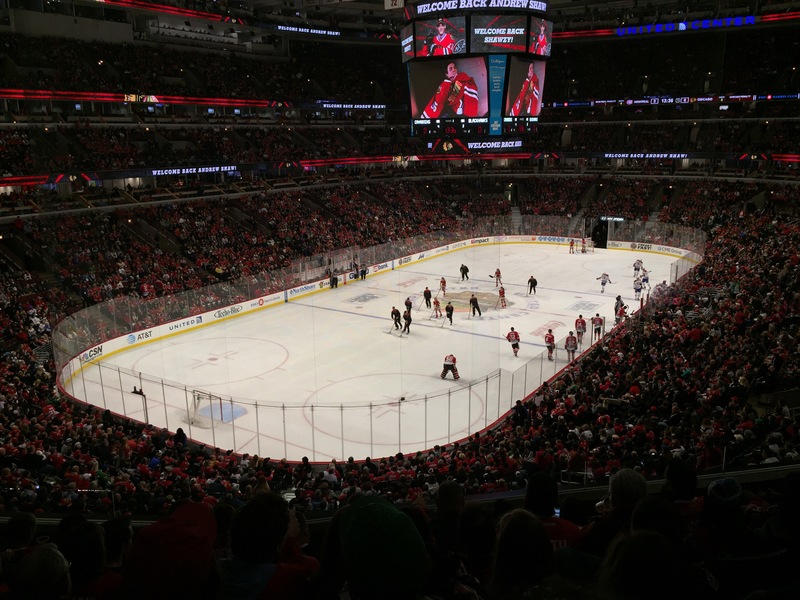 If you include standing room, it is the highest capacity building in the NHL. Without it, it stands third behind the Joe Louis Arena in Detroit and the Bell Centre in Montreal. Both the Blackhawks and the NBA’s Bulls share the building’s operations. As we wandered outside, our red Habs jerseys didn’t stand out as much as usual since most fans were sporting similar coloured home apparel. We exchanged a few knowing smiles with other Montreal fans, and met one former Montrealer now living in Chicago who was ecstatic to be able to speak some french with us. This is a constant element in our travels: we meet Habs fans everywhere, some local, some expats and some who’ve made the same trip as us. But all greet us like old friends, with a common bond forged in allegiance to our home team. We visited the Stan Mikita and Bobby Hull statues, very nice pieces made even greater with the addition of colour. Unfortunately, the Michael Jordan statue is currently inaccessible, having been relocated to the new atrium that’s under construction. We then made our way inside the building. Access was fast as the initial rush was in. The security guard quipped that our Habs jerseys should have set off the metal detector, but the staff was amazingly nice throughout the building. As we wandered around, soaking in the sights, we passed a few Habs fans, many local but some from Montreal, and stopped to chat about the team and the Subban trade. EVERYONE wants to hear about the Subban trade. The United Center is well laid out, and navigation in its corridors is pretty easy. From the staff to the most devoted Hawk fans in the building, everyone treated us like guests in their house. Sure, we were wearing enemy colours, but above any rivalry stood a shared love of hockey. We chatted about the other team’s hot rookies, about THE trade, about the fact that both teams were hot at the moment, but it was always done with respect. I can’t praise the Chicago fans enough; they were class acts all the way. Concessions were amazing too. Forget about plain old hot dogs and stale pizza slices; they had a pub, and much more sophisticated fare. We had some tacos and then headed to our seats for the warmup. Our tickets brought us to the Club level (that explains why the tickets were so expensive I guess), a less populated area with service to your seat. I enjoyed a nice Mai Tai while watching the warmup (better than American beer, sorry for my friends in the US). At a pre-game ceremony, former Hawks (and former Canadiens) Denis Savard was honoured. The diminutive forward skated around the rink, waving at the crowd while footage of his career highlights wearing the Chicago uniform played on screen. A 3rd overall pick in 1980, Savard saw his number 18 retired by the Blackhaws in 1998, and he entered the Hall of Fame in 2000. Known for his famous spin-o-rama move that helped him beat so many defensemen, Savard was one of the most electrifying players of his generation, and he received a well deserved standing ovation. But strangely enough, while I’m sure it was no coincidence that the team honoured him while the Canadiens were in town, no mention was made of his time in Montreal where he won the Stanley Cup. In an incredible show of respect, the crowd turned towards the Canadian flag for the anthems, and to our surprise, it was sung in both french and english, just like in Montreal. Chicago, you’re a class act all the way. And now it was time for the puck to drop, with the Montreal-born Corey Crawford in goals for the Blackhawks while Chicago-raised Al Montoya would protect the Canadiens’ net. Two of the hottest teams currently in the NHL were about to battle it out. The first period saw both teams being careful not to give to much room to the other, but the Hawks were able to capitalize and score the first goal of the game. During one stoppage of play, the team welcomed back Andrew Shaw, who left in a cap-motivated trade last summer, with a video compilation of his time in Chicago. I must admit that I was surprised by the love Chicago has for Andrew Shaw; I even saw a few Hawks fans sporting #65 Habs jerseys! So far I haven’t seen a player worthy of such admiration, but let’s give the guy some time to adjust to his new team. The second period seemed to go the visitors’ way, with goals by Shea Weber and Andrei Markov putting them ahead by one. Usually when the visitor team scores, you hear the crowd go “aaaww”, but the United Centre was dead silent whenever the Canadiens scored. No booing, no jeering; just indifference, and a quiet confidence in their championship team. It was a very peculiar experience. On the flip side, anytime the locals would score, the arena exploded in pandemonium, with the jumpy chorus of “Chelsea Dagger” leading the way. I have to say: as a visitor, I absolutely HATED hearing that song, which of course means one thing: it’s a PERFECT goal song. But after Marian Hossa tied the game at 2 each, Patrick Kane score a “goal of the year” candidate where he easily beat Montreal defensemen Jeff Petry before beating Montoya with a wrist shot while being dragged to the ground by Max Pacioretty. As much as I want my team to win on these trips, seeing such an amazing goal right in front of me makes the trip worthwhile. In the 3rd period, the Blackhawks tightened up the play and protected their lead. They weathered the Habs’ pressure and when the buzzer rang, they prevailed 3-2 in what was a hotly contested game. Despite the loss, the Montreal team played well but in the end, the Hawks were just too strong. We left the arena on foot, happy to avoid the traffic jam around the place. We walked to the train station, and took a blue line train to downtown, a few blocks away from our hotel. We have a tendency to fear public transport in cities we don’t know, but Chicago’s trains are a very efficient way to get around, and not very expensive at 3$ per person. 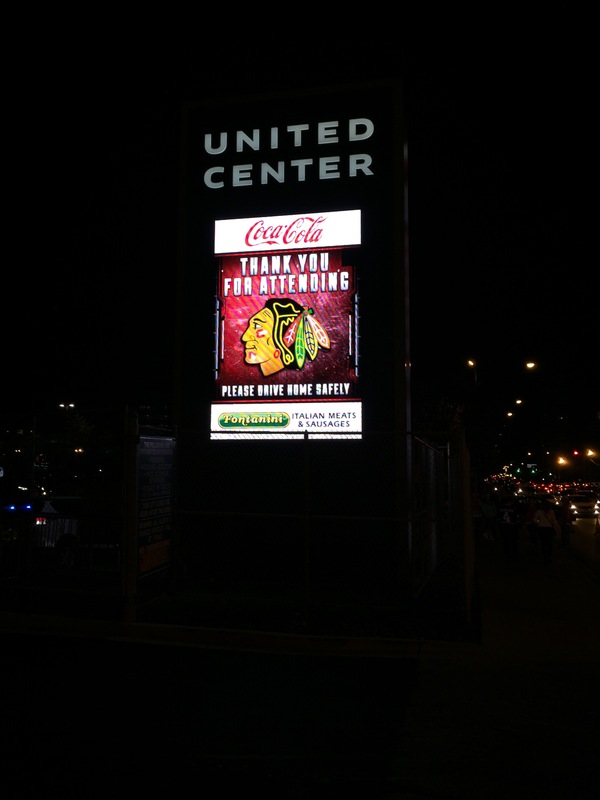 During the trip, another Hawks fan congratulated us on a hard fought game (not that we really had anything to with it), further cementing our opinion of the Chicago fans. We got to our room completely beat, having been up since 3AM. Showers, a quick bit of reading and we fell asleep in the comfy beds. We woke up refreshed and ready to make the most of our last day in town. We went for breakfast at the nearby Corner Bakery Cafe, which turned out to be decent, nothing more. Of all the spots we wanted to see, we had time to see one and we settled on the Field Museum. The Virgin Hotel offers free Tesla rides to guests, in a 2 mile radius, so we took advantage of the service and rode to the museum in style! The museum is located on the southern part of Millenium Park, right by Soldier Field Stadium where the NFL Bears play. It’s a majestic building, a relic of another time when constructions were not strictly made for function but as an architectural statement. A shelter for the stairs was a concession to the looming winter, one that unfortunately ruined the facade’s look. 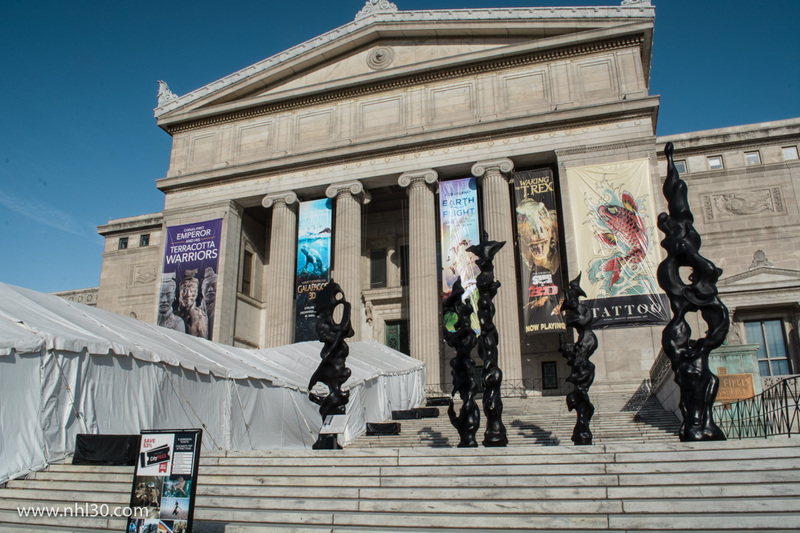 The museum’s collection was first assembled for the 1893 Chicago World’s Fair. The Field Columbian Museum, as it was known then, was then housed in the Fair’s Palace of Fine Arts until it moved to this dedicated building, which opened in 1921. A product of a bygone era when rich western explorers had no qualms in taking historical artifacts from other countries, the museum boasts of an impressive Egyptian collection that includes 23 human mummies, two large exhibits dedicated to mammals of Asia and Africa, a Hall of Gems and much more. We didn’t have time to explore all the collections, but made the most of the time we had. We spent some time in the temporary exhibit that explores the cultural significance of tattoos around the world, marvelled at the Ancient Egypt collection, explored the daily lives of the African people and studied the evolution of humans in the Ancient Americas. 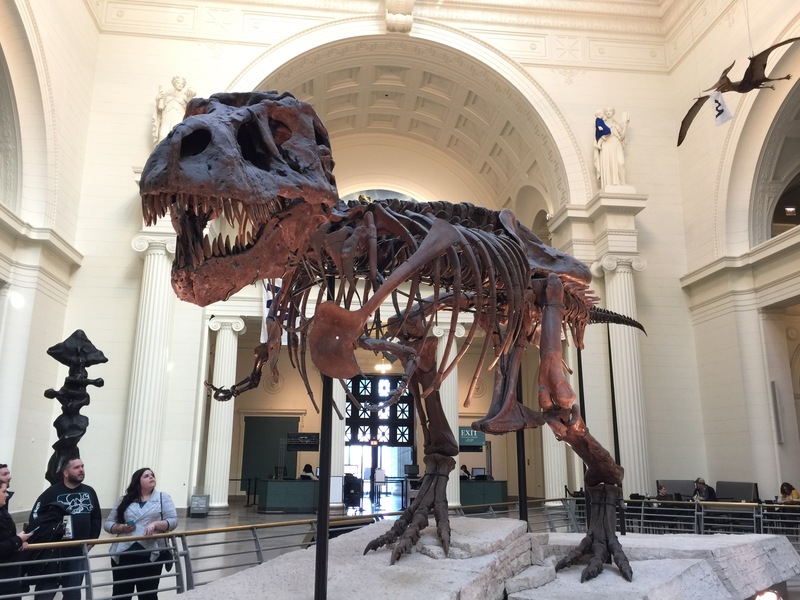 The Field Museum stands with the American Museum of Natural History (New York) and the National Museum of Natural History (Smithsonian Institution, Washington DC ) as one of the best museums in the United States. This is the kind of museum you can spend days in, but with a late afternoon flight waiting for us, we had to take in as much as we could and then leave. Another reason to come back one day? One thing we love to do on these trips is to sample local specialties. So we called an Uber and went to the nearest Giordano’s to sample Chicago’s famous deep dish stuffed crust pizza. The founders of Giordano’s are said to have introduced the dish to America when they opened in 1974, based on their mother’s recipe, but a rival chain, Nancy’s Pizza, also added it in the same year. But Giordano’s is generally considered the most likely inventor. Even deeper than traditional Chicago deep dish pizza, the crust is shaped into a sort of bowl, filled with cheese and filling, then topped with another layer of dough so that cheese fills the dough. You need a hefty appetite to dive into one, but oh my, it’s so delicious! We ate until we were full, and still had a couple of pieces left, so my wife had the great idea of getting it boxed to go, and we handed the leftovers to a mother and her child begging in Millenium Park. We should do this more often, instead of throwing away perfectly good food. We walked the entire length of the park, stopping to look at statues and buildings. The architecture along Michigan Ave is stunning! We got back to our hotel, grabbed our bags, got the car and headed out to the airport. Our Chicago adventure was coming to a close. I was still full from the pizza, but we stopped at Stanley’s Kitchen and Tap, a pub dedicated to the Chicago Blackhawks, for a little snack and drink. The food was typical airport fare, but the decor provided a perfect conclusion to our trip. 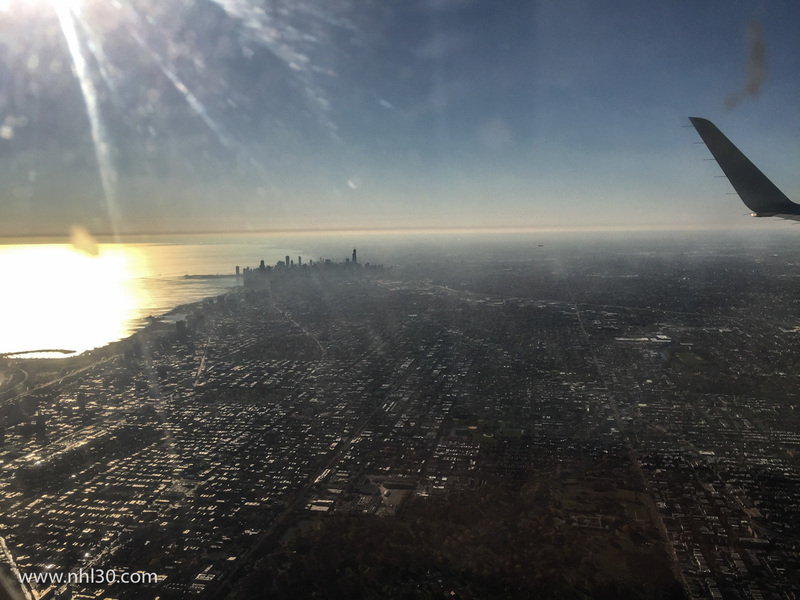 I was very impressed by Chicago; it has a very distinctive style that, while at times similar to New York City, is really completely different. It has great architecture, great culture, great food, great sports, an most importantly, great people. Thank you Chicago for your hospitality! Up next for us: Tampa Bay in April. And with the Las Vegas expansion, I’ll need a new URL, as nhl30.com won’t cut it with 31 teams in the league! The view from our hotel room, on the 24th floor. Our room at the Virgin Hotel. A mix of British Swinging 60’s, modern comfort and IKEA. Ceramic dog leashed outside a room. Depending on time of day, the light and shadows change the look of the buildings. Puppet theater at the start oif the Magnificent Mile. Weird but awesome. At Dylan’s Candy Bar. Dylan’s Candy Bar offers your favourite celebrities sweets of choice. Now THAT’s baseball I can get into. Does that mean the Cubs cheated? Looking southward across the river from the begining of the Magnificent Mile. High class vandalism: chunks of great world monuments were stuck into the building’s wall. A San Francisco institution that has a foothold in Chicago. Everyone’s cashing in on the Cubs’ win. That W is everywhere in Chicago. Those two statues stand at the start of the Magnificent Mile. I did not know that Chicago had been founded by an Haitian. Chicago founder Jean-Baptiste Pointe DuSable. The toiletteries at the hotel. The sheep was a nice touch. The “bean” (real name Cloud Gate) is a famous tourist attraction. Millenium Park is full of contemporary art like this. Selfie on the Cloud Gate. This monument bears the name of every player to have worn the Hawks uniform. Hawks great Stan Mikita is immortalized in front of the arena. 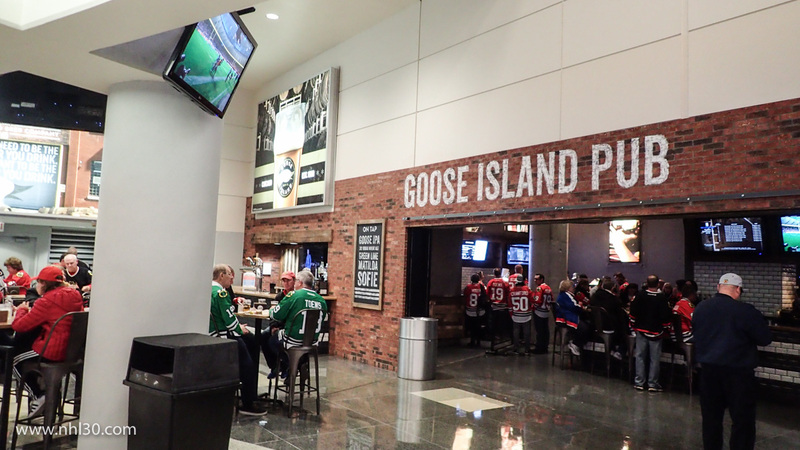 The concessions are amazing at the United Center. The scoreboard has too many ads for my taste, but it’s really nice. People really miss Andrew Shaw there. Great tacos! Much classier than hot dogs. Some history up in the rafters. Nice touch I haven’t seen anywhere else: listing players ont he ice. 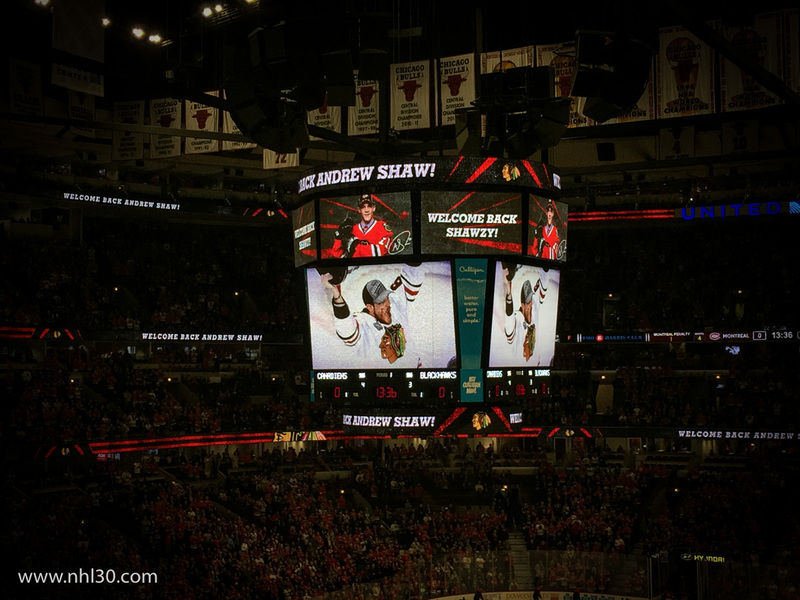 Chicago LOVED Andrew Shaw, and gave him a classy welcome back. Chicago’s famous L train looks well worn in some places. Their African exhibits focuses on daily life. Very interesting. I don’t care what the caption says: this HAS to be the seal of Thulsa Doom from Conan the Barbarian. Right? Travelling music salesman. This tape rack is attached to a bike. Even the museum exhibits got Cubs fever! Chicago’s famous deep dish pizza. Giordano’s claims to be the inventor, although there are other claimants to the title. Green Line beer, a local brew. The muse of Music in Millenium Park. Tribute to Theodore Thomas, patron of music. Found this guy in front of our hotel when we came back! 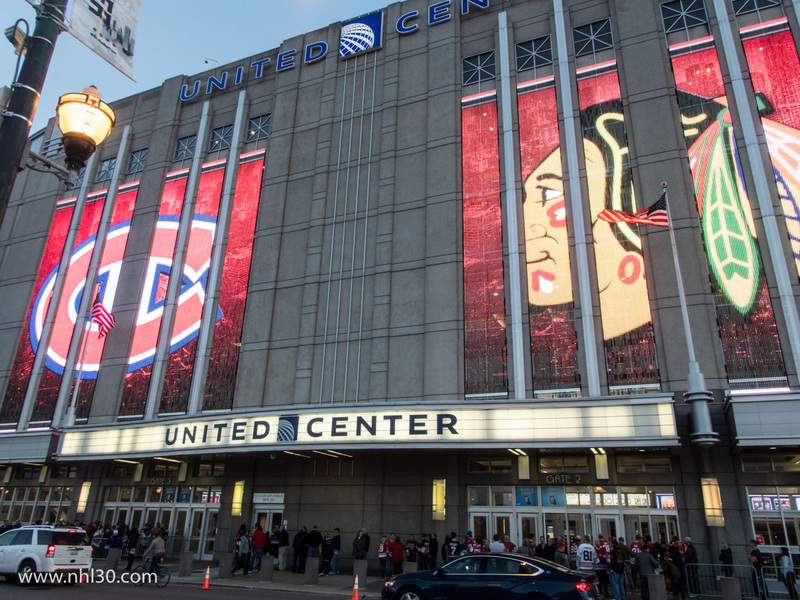 This entry was posted in Games, Photography, Sightseeing, Travel and tagged architecture, black hawks, Canadiens, Chicago, United Center by Jean-Frederic Vachon. Bookmark the permalink.